This week we step away from aviation and look at plate tectonics and tsunamis and try to answer the question: could a tsunami strike Pensacola? Where are the known plate tectonic boundaries that could impact Pensacola? How fast does a tsunami travel in open water? Participants will utilize water current equipment to stimulate their own tsunami to find out the answers. Registration is $10 per child and lunch is provided. Register early, space is limited for each session. 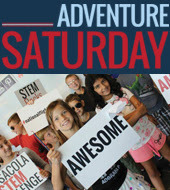 Click here for Adventure Saturday programs.